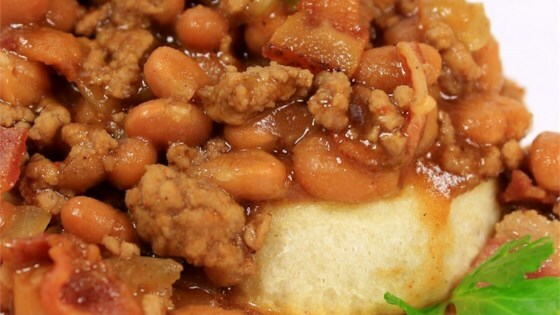 "This combination of hamburger, beans, and bacon over biscuits will bring out the cowboy in anyone. It has become a family favorite. It is so easy to make, and we love to make it when we're camping." We used this recipe camping, and it was great after a long hike! Instead of biscuts, we used sourdough rolls and cut out the centers to make bread bowls. Yum! Very good. I made it at home in an iron skillet and placed drop biscuits on top and then finished off in the oven to ensure browning. Will definitely make again!